If you’re reading this and then it means you are lucky enough to be staying in Lin and Geoff’s villa. 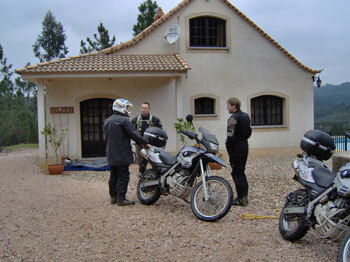 I had the pleasure of staying here for a week in October 2011 for a week of motorcycling and relaxation – whether its on road or off road biking, there really is something here for you. Some of the road trips we went on were just outstanding with fantastic scenery and glorious mountain roads with all kinds of sweeping bends and turns. And the best thing is that most of the time you are riding alone – you just don’t get this in the UK. We spent hours driving through secluded villages and even stopping for lunch in places where we could sometimes have a swim – glorious! 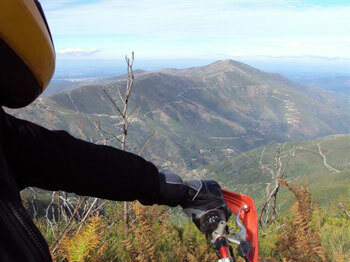 If you are into off road riding, Geoff can make this as challenging as you want and there is something for everyone. We stayed full board and the breakfast, packed lunches and three course meals in the evening with wine and beer were faultless. Geoff and Lin are the perfect hosts and nothing is too much trouble for them. Unfortunately, I wasn’t well for a day or two and they showed nothing but care and consideration. This place is paradise and I will be back again for sure one day. My wife and I had come across Thrustforth Motorcycle Holidays whilst looking for a different style of motorcycling holiday on the internet and different we got. How can we put into words our experience of a short break with two wonderful people in a stunning location who have a wealth of knowledge of the surrounding areas? Well we will have a go!! Wow, when you walk into the villa and look out over the valley the view is nothing short of amazing, the villa is quite rustic and spotless with everything you need for either a family holiday or a group of bikers looking to use it as a base to explore this area of Portugal. Everyone has their own idea of what paradise should be and for us this was it. There are few places that we have visited over the years that immediately make you feel so relaxed, at ease and happy while walking around with a permanent smile. We thought it was too good to be true, but how wrong we were, from the moment we met our hosts Geoff and Lin who incidentally met us at the end of their lane. (We thought this was a nice personal touch. We arrived on a Harley Davidson Electra Glide which was definitely going the be a bit of a handful on the narrow and twisty mountain roads in the areas that Geoff had planned to guide us on but Geoff being the very helpful and friendly gentleman that he is suggested that if we wished we could use one of his immaculate and very well maintained BMW 650 Dakars so that we could get to experience the real Portugal, I gladly took him up on his kind offer. Okay enough about Geoff for a moment, there was one other very important member of the team who helped make our stay at Casa Roda very enjoyable and hassle free, which was Lin. The villa was very welcoming and homely with an abundance of space allowing us to sunbath, stay cool in the shade of the various terraces and balconies around the villa or to just simply cool off instantly by plunging into the beautiful swimming pool, after having explored some of the great treks around the property. We decided to stay at the villa on a full board basis and full board it was. Lin ensured that we were well fed at breakfast, supplied us with a healthy packed lunch for our ride outs and a delicious evening meal after a hard days riding. Lin also made sure that the beer was always cold and the fridge and cupboards well stocked with all our needs. We really enjoyed and looked forward to the after dinner chat and exchanging stories with Geoff and Lin around the dinner table. (They are two very well travelled and interesting people) When Geoff and Lin would leave us to return to their own villa after an evening of laughter and light hearted banter we would sit on the terrace and listen to the enchanting sounds of the forest and the church bells, we found it very difficult to tear ourselves away come bed-time. We just didn’t want to leave so are already making plans for our return trip next year. Thank you so much Geoff & Lin for a truly memorable experience and one that we will no doubt repeat many times, we will be in touch with dates etc. very soon for our next trip. 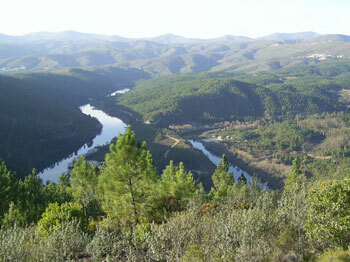 Portugal is a beautiful country and thanks to Geoff we got to see the “real Portugal” – stunning! 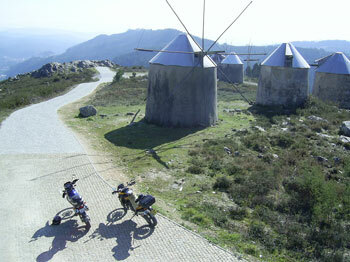 Our bike tours made our holiday a fantastic way to see the countryside. We had 2 days out on the bikes with Geoff – he made an excellent guide and companion and the twisting, turning mountain roads were thrilling to ride on. This is our fifth motorcycle holiday at the villa and as ever has proved a delightful time. We are on a month long tour of Portugal via northern Spain, riding our own bikes, having previously undertaken fly ride visits here. The “welcome back” banner on the entrance to the drive was a nice touch to make our arrival feel extra special. We love the villa and excellent fully catered service which has drawn us back time after time to experience this motorcycling heaven. The roads are still brilliant, the trails are still fun and the week has passed far too fast. Even the weather has been perfect. In the last few years we have known several motorcycle guides and Geoff is certainly our favourite and probably the best. He always goes the extra mile to ensure his guests have a fabulous time. Many thanks to you both for everything. What could be worse than to go on planned motorcycle holiday not having own motorbike licence and being pillion without your motorbike rider? I'd thought that the worst would happen to me as my friend couldn't come and I arrived here alone expecting to spend one week suffering loneliness... But thanks to Geoff and Linda it turned out completely the opposite - that holiday was one of the best holidays in my life! Since I arrived I've forgotten that I'm a client and felt like visiting best friends. Geoff and Linda were doing all the best to make me feel comfortable and welcomed. Every day I was riding pillion with Geoff on many of his motorbikes enjoying each minute of our rides. He is a very experienced motorbike rider, so as a pillion I felt safe and comfortable all the time on both on- and off-roads even when it was raining. He knows all the roads and trails in the area to get interesting places, so each time when we stopped for sightseeing, lunch or just a cup of coffee I always thought "Wow, such a wonderful place!". And I'm sure he has much more routes for the next holiday, one week is too short to explore everything. villa, so I was practising on my small Kawasaki a lot and even tried to ride a Suzuki 250! Geoff is a professional instructor, he was very attentive, patient and always ready to help or explain my mistakes. The villa is such a lovely house - well-planned,clean and cosy, situated in such a beautiful and peaceful place. Each evening I enjoyed a delicious dinner in Geoff's and Linda's company, friendly chatting or just listening to Geoff's nice and funny stories. So, the time I had on my own was just enough to relax a little bit on the terrace and go to my comfortable bed for sleep to be prepared for the next adventure in the morning. Cleo and Bobi made me feel even more like at home, it was so nice to go for a walk with Linda and the dogs. Fortunately for me Geoff and Linda didn't have other guests after my holiday, so I had a chance to change the second part of my trip through Portugal and come back here for two more days, which was a real pleasure. 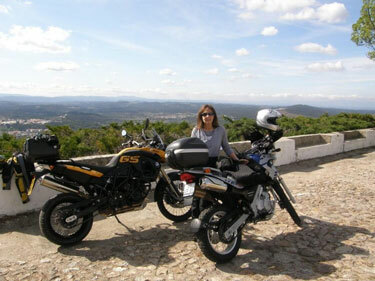 Moreover Linda helped me to buy a ticket to the MOTO GP race in Estoril, which was a bonus that made my whole holiday completely "motorbiking" and I'm really happy to catch this "motorbike illness" that changed my life. The only dream that I have now is to get my motorbike licence, buy my first motorbike, improve my motorbike riding skills and come back here for the next holiday to do more and MORE riding! Thank Geoff and Linda so much for the nice holiday, you both made me really happy! We were impressed with this thoroughly pleasant villa, which is well placed in a tranquil and rolling environment that welcomed exploration. Geoff's motorcycle tours have been days exceedingly well spent. They were consistently rewarding and adaptive to our wants, whims, and - dare I say - variations in our off road abilities! Lin, thank you for keeping us well fed with good food & for the great hospitality both Geoff, yourself, and the dogs have shown. A week well relaxed, a week well spent. With only days to plan we found you on the internet. With many months to plan we would not have found better! The trip was so far above our expectations that we want to start planning our return. Linda's cooking is the best - no-one goes hungry. Geoff's planned out motorcycle trips are fantastic. He takes 20 years of knowledge of the area and then shows you the best routes. You cannot do this type of sightseeing on your own. I am not sure even the locals known the places he does! Let's not forget that the off road riding is intense but you will get whatever skill level you want. The house is very comfortable and the surroundings are very peaceful. We are relaxed, tired and very satisfied. Thank you both for the perfect vacation. Thank you so much for having us here again. We have fallen in love with Portugal all over again this holiday. The villa is so relaxing and you have been so thoughtful. We have so enjoyed ourselves - me out driving around the villages in the hire car, all new experiences for me on the other side of the road! Paul has been having the time of his life out with Geoff on the bikes which was a wonderful experience with the added pleasure of meeting up with the other local biker friends. Lovely food and company and a great time with you both. We hope we can come again soon. There is only one fault - we have to go home!! What would be your dream motorcycle holiday? Your favourite kind of roads with no traffic and no potholes? Exploring new territory without having to plan ahead or stop to check the map or think about where and when to fill up with gas? 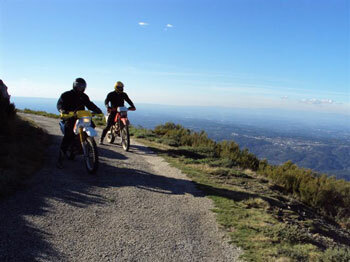 Experiencing a new way of seeing the countryside by riding off-road with an excellent trainer? Having all your meals prepared for you and enjoying them with good company? This holiday had all that. It was like visiting friends without feeling you were imposing and was the best holiday I could have imagined. Geoff knows how to gauge your level of skills and what pace is perfect for you, and he is very patient as well! Linda makes yummy lunches and is a super cook. Walks with Bobi dog were great too. I'm still smiling in my helmet two months later, and I can't wait to come back next year for two weeks instead of one! Thank you Geoff and Linda!! 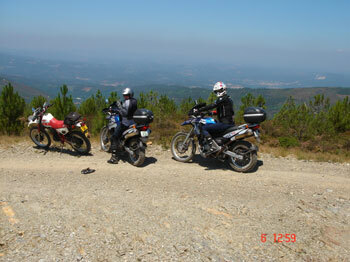 I went back to Portugal in September for another fabulous week of biking. The week culminated in a day at the MotoGP races in Estoril. Seeing thousands of fans riding their bikes to the races from Lisbon was almost more thrilling than watching Valentino Rossi in his attempt to win the title! We have had a better 2 wheeled holiday than we ever expected. So much so we've forgotten the day, month or year. But Geoff says its time to go home to the UK now! Read the comments - what's more to say? but "Ride On". No shopping - no cooking - no washing up. Good riding with Geoff - even Lin ordered me the right kind of weather. What more could I want - only to take Lin back home with me to cook our meals. Linda and Geoff - thanks for this unforgettable week - the adventures and all the good story telling. The three of us - Lex, Maarten and me (Mark) thoroughly enjoyed the hospitality and trust you put in us with your bikes! 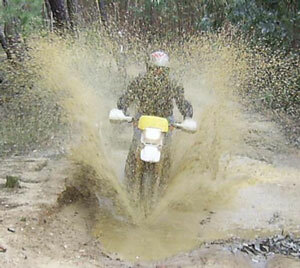 Geoff promised us a "gentle introduction to off road riding". After finishing our day's programme in half a day, he noticed our incompetence being largely compensated by indifference and so he decided to chase us up killer hills with some limited form of instructions and introduced us to his friends to further get us exposed to the "real thing"
Off road riding has infected us!! This motorcycling holiday exceeded our expectations in all respects. We arrived as paying customers, but were made to feel like honoured guests. The villa provided a clean, well-equipped, spacious and comfortable home base, yet we had no housework to do. All our meals were freshly cooked in our kitchen (good wholesome home cooking) and then quickly cleared away and washed up. We were provided with tasty sandwich lunches on most days, or occasional snacks in cafés. The location is very private, with delightful views and is very tranquil – provided those noisy motorcyclists aren’t out having fun! 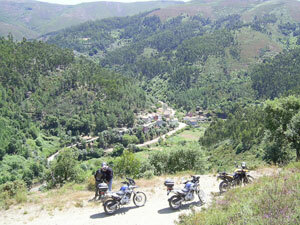 This part of Portugal is a motorcycling playground, both on and off road. 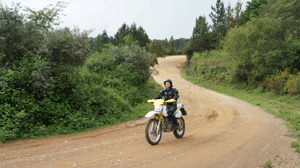 The immediate area provides direct access to good motorcycling roads and tracks. There is a public motocross circuit a short ride away. All the roads were a real pleasure to ride, with sweeping bends, good surfaces and few cars. 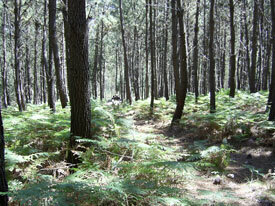 The off road capability of the bikes opens up access to the extensive network of woodland and mountain tracks. Geoff knows these well and can lead you unhesitatingly all over the attractive countryside. Our motorcycles were in excellent condition and well maintained. We returned from a ride an hour before departure and by the time we left they had been washed and were once again gleaming in the sunshine. Well fitting body armour and boots were provided, some items brand new. Winter weather was perfectly good enough for motorcycling, i.e. much better than the UK, but bring your winter kit for the roads, especially if you want to visit the highest mountain. One of the Dakars is equipped with heated grips. When the sun shines it is pleasantly warm in the daytime but mostly we kept our coats zipped up when stopped. You keep much warmer when off-roading, probably something to do with your adrenalin level. As may be expected, the finest weather was on the arrival and departure days! We were delighted with the opportunity to experience off road riding for the first time, and in such a unique location. The quality of the bikes and tracks were impressive and will not disappoint more experienced riders. 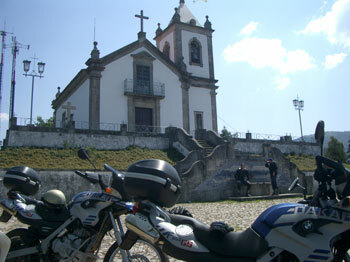 In common with much of Europe, Portugal is very biker friendly. In all the miles we rode in Portugal we only experienced courtesy from others - so different from the UK motorcycling experience. We had a most memorable time; Linda and Geoff were perfect hosts, who went out of their way to ensure we had a lovely holiday and tailored our tour to our specific capabilities and preferences. Following our winter motorcycling holiday we could not wait to get back for a two week holiday in July. Once again we flew with TAP Portugal and were pleased with the Gatwick – Porto experience. The mobile mini-bar provided for the drive to Roda ensured we were suitably in holiday spirits on our arrival in time for a delightful evening meal on the terrace overlooking the lake. The villa is absolutely perfect if you like peace, quiet and privacy. Spotlessly clean, in an idyllic location and with glorious views. We enjoyed our pre breakfast walks with Bobi Dog along the tracks and beside the lake. Our hosts looked after us incredibly well, great food, company, accommodation and motorbikes. The bikes were once again in perfect order – freshly serviced and a delight to ride in this beautiful rural area. Geoff found fantastic routes from mountain tops amidst purple heather, boulders and wind turbines to valley bottoms beside cooling streams and crumbling ruins. Since winter the Portuguese had thoughtfully sprinkled a light smattering of gravel on a few corners, luckily this presented us with no problems. After a day in the saddle it was a real treat to relax on the sun loungers and swim triangles in the pool. We were delighted to be given champagne on our anniversary after a wonderful day out on the Dakars. Next morning we were both hung over! Perhaps we should have stopped before we drank all the red wine and port too. The effort Geoff and Linda expend on their guests to ensure every comfort and happiness is impressive. They have created a little bit of Shangri-la, which they generously share with guests, spreading pleasure to those of us lucky enough to have discovered this Utopia. I have been captivated by the magical charms of this place. Both summer and winter holidays have left me yearning to return to follow Geoff around by day and luxuriate over good food and wine in the evenings. A truly self indulgent lifestyle that I happily settled into and wished would never end. There is always the next ride out to look forward to. A few days on a Thrustforth motorcycle holiday made me feel like a younger woman. It is probably fortunate that my husband did not feel quite the same! May I suggest that you furnish the bookshelf with a copy of “Uneasy Rider” by Mike Carter. It’s a good laugh. Where can I start, we have said it all before – Geoff and Linda have organised yet another magnificent motorcycling holiday for us. It was particularly impressive to find that every detail was taken care of, from the bottle of bubbly on arrival to the clear blue skies and bright sunshine all day, every day. A complete escape from the usual routine problems and anxieties of life. Here we only have to worry about getting round the next bend, as opposed to being driven round it! Geoff took us on a whole range of new routes, the twisty mountain roads are of course an absolute delight with so few other vehicles and lovely views all around. A complete contrast to the UK road network. Off tarmac riding has been the unique selling point of the tours and opened up an enhanced world of touring to us. We saw such a lot of beautiful countryside in remote locations which we would not have found without a guide. The challenge provided at the tricky bits was a pleasure and I am most grateful for the confidence that Geoff showed in us as we rode his precious machines off road. Our memorable moments included muddy sumps, long steep hills, picturesque little pathways and places I would hesitate to ride a push bike – let alone a Dakar. It was all jolly good fun that always leaves you wanting more. We appreciated the interesting demonstration of satellite navigation in remote areas. Fortunately our only puncture manifested itself overnight, which was so much more convenient for Geoff than our last one which he repaired on top of a windswept mountain. The biking was brilliant, but I should also add that we loved the food and accommodation too. We liked our relaxing evenings in front of the fire in the comfort of the villa, which after our departure is to be redecorated. No doubt it will be better than ever; although it looked practically perfect to me. It's sad to leave this pampered idyll of self indulgence for the reality of world depression. I was very pleased with the motorcycle holiday and all I got for the price. 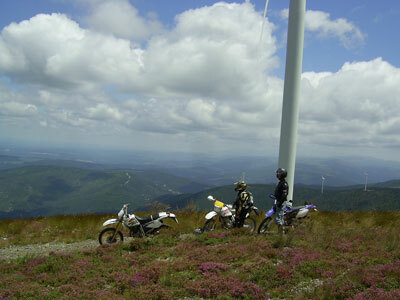 I thought the region with its varied sights and terrain was perfect for a motorcycle holiday. The off road rides were "right up my street" and I enjoyed every minute of them, rain or shine. The bikes were excellent and a very major reason why I chose this holiday. I cannot fault the villa in any way. The meals were also faultless and superb. The views from the villa and during the whole trip were excellent. We chose our own start times. The ride lengths were great for me - long enough to let you know you'd been out riding for the day but not so long as to spoil it with an overly tired last leg home. The comfort and hospitality was outstanding and I could not have asked for better. I had a really great time here in your villa and on the bikes - your friendliness and hospitality were a huge part of my enjoyment - many thanks indeed. The views from the villa over the lake were exceptional and the views around the region were stunning. I had a fantastic time and I love Portugal - thank you. The food was fantastic … Full board was great. "Not quite ready for the Long Way Round? We tried the shortened version. 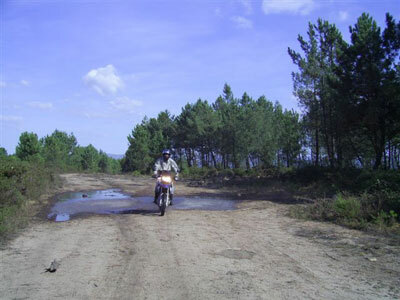 I thought that your readers might be interested to hear about a fantastic, adrenalin-filled day out we experienced with Thrustforth Motorcycle Holidays in Central Portugal (www.motorcycle-holiday.com). Tired of life in the UK, my family and I have decided to make the break and move to Portugal; lock, stock & barrel. Andy Brown, a close friend and fellow road bike nut offered his services to help me move my “stuff” from the UK to the new home on the Portuguese Silver Coast. Having recently seen the DVD, “Long Way Round” with Ewan MacGregor & Charlie Boorman it inspired me to start planning a long touring trip…… Very quickly reality struck, so instead decided to search on the web for interesting sites about off-road BMW’s, touring etc. 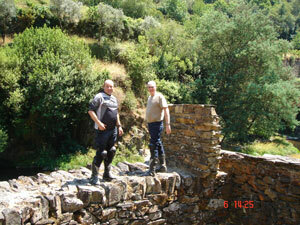 I came upon a site run by a guy called Geoff Philips of Arganil, Central Portugal. 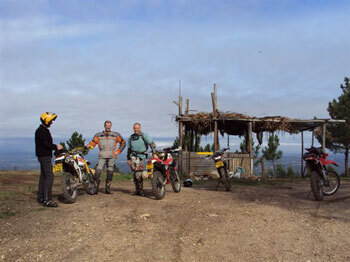 Geoff runs a holiday villa (www.portugal-villa-holiday.com) which can be rented in its own right, but they also organise off-road, guided motorcycle touring holidays, combined with full board accommodation in the luxury villa. I e-mailed Geoff to see if it was possible for us to visit them and sample what they have to offer, just for a day. Geoff said that he was prepared to take us out for a day’s off-road tour. We started out bright and early from our new home on the coast, a couple of hours later we arrived at Geoff’s villa some miles east of Coimbra, up in the mountains. It took some finding, but fortunately we were given excellent instructions by Lin; we were also armed with a Garmin portable satellite navigation unit; this took us to their door step, just by entering grid coordinates! The location of the villa is stunning, evidently Geoff built it himself; it has a wonderful bird’s eye view of a lake, totally awesome! Upon our arrival at the drive to the villa we were met by Geoff, also sitting there were two immaculately presented, and matching BMW F650 GS Dakar motorcycles. After introductions we went inside the villa to discus the day ahead and get ourselves kitted up. Geoff, aswell as being extremely enthusiastic about anything to do with bikes, he is also very particular about the preparations for a trip. 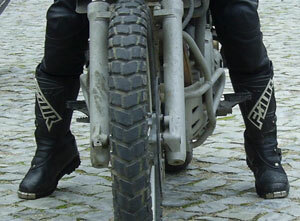 He furnished us with full body armour and motocross boots (again, all the equipment was immaculate). We then went through the formalities of licences, passports, the signing of a disclaimer regarding the bikes. Linda packed us up with a lunchbox each, which we stored in the top box of one of the F650’s, off we went! Geoff was riding his trusty Yamaha XT350, Andy and I followed on the Beemers. Initially Geoff wanted us to get familiar with the bikes and at the same time he could evaluate our ability; this was done by a quick 2 mile easy off-road trek around the lake. 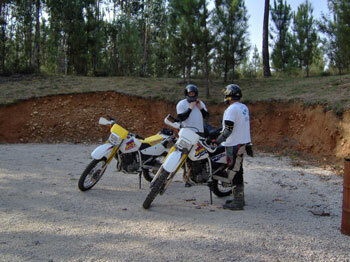 Both Andy and I had little if no experience of off-road riding so Geoff helped us out with a few pointers. 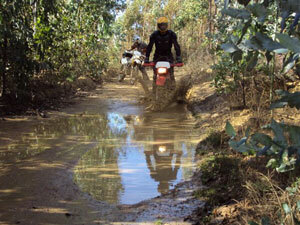 We decided amongst ourselves that we’d go for a combination of off-road and on-road riding. Geoff always led the way with the XT. We followed, taking it in turns to be No. 2; being No. 3 you could have a chuckle at the troubles of the guy ahead, and then end up in the same predicament yourself! In the vicinity of Geoff’s villa there are countless off-road trails of varying severity; he started us off on the easy routes, separated by intermediate road sections with long sweeping bends, occasional extremely tight ones. This showed what a great and versatile bike the F650 GS is; it had me questioning myself, is a road bike really necessary? Before lunch we followed a long trail up into the stunning scenery of the mountains. This is not the baron and dry Portugal we all hear about, here it is green! All extremely exhilarating, but it showed our lack of fitness! At one point Geoff stopped and said to me “We’ll stop in about an hour for lunch”. By this time Andy and I were about fit to drop! Anyway, we kept going and ended up in a superb scenic location by a river and waterfall. Geoff suggested we go for a dip in the river but we decided the mountain water might be a touch nippy and thought we’d best wait till the end of the day instead and try Geoff’s pool. Lunch was crusty Portuguese rolls with ham, cheese and salad. It all went down extremely well! We then headed back out to the trails. By the late afternoon our confidence on the Beemers seemed to be coming on leaps and bounds. Finally Geoff took us though a section of woods for some “fun”. All went very well until we came upon what looked to be a steep and tricky downhill section. Amazingly we got down in one piece and bikes unscathed. A short while later we arrived back at the villa, quite exhausted but chuffed that we’d made it. After peeling off the armour, boots etc. Geoff opened the fridge and brought out a couple of beers, it tasted great and didn’t even touch the sides! Finally we put on our trunks and took a dip in the pool, fantastic! 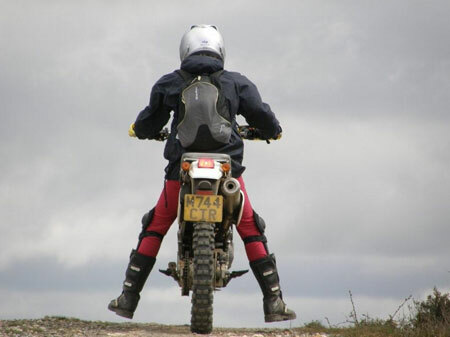 I would have no hesitation to recommend Geoff Philips and his Adventure Motorcycle holidays to anyone with some experience with bikes; to a road biker such as myself it presents a whole new aspect, which has probably got me hooked to try more “off-road stuff”. Chatting to Geoff, he is very flexible in providing a trip for anyone; evidently they are only two hours from Porto and three from Lisbon. Geoff can even collect from the airport if required. I hope to return soon and next time to try some of the smaller, agile bikes that Geoff has to offer. The day’s trip wasn’t quite the Long Way Round, but it was close enough for now! Dominic and I had a great time playing with Geoff's motorbikes. Good bike tours on well prepared motorcycles. Geoff did a great job of finding routes to suit our preferences and abilities. We enjoyed and learned a lot. The villa was fine, comfy, roomy with great scenery. We couldn't ask for more. Thanks Geoff and Lin you fed us well and kept us entertained. Had a fantastic day on the Suzuki 250s with Geoff. Great mix of tracks and tougher stuff. Also had a bonus trip to Estoril to see the Moto GP. Some great rides to do around here if you're on a bike. 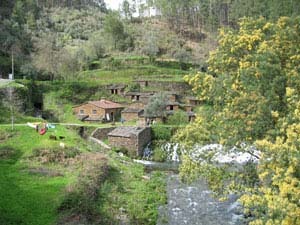 Went to the Manteigas - good roads and scenery. The visit to Caramulo is well worth it. A motorbike trip on a BMW - from an inexperienced pillion passenger's point of view! 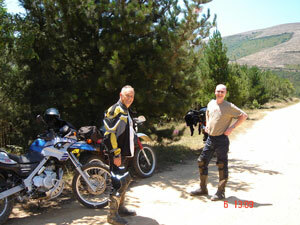 Yesterday we enjoyed a motorbike ride into the mountains with Geoff and Lin. We rode to Arganil then turned off onto the mountain roads - the scenery was beautiful and the air smelt of pine and eucalyptus. Geoff and Lin ahead of us travelled at a steady pace enabling my husband Colin and myself to take in all the excellent views. We rode through small hillside villages, with the odd dog asleep in the autumn sun. There was very little other traffic on the road. We stopped for lunch near the top of the mountain and ate a delicious meal of braised wild boar, cabbage and roast potatoes at a restaurant in a small town called Fajao. On the way back down we took a different route, more magnificent views and stopped for a break at a river valley near Gois. The river was crystal clear and a few goats grazed nearby. There were some small buildings and a house made from materials that seemed to have been collected nearby - roofs made from irregular pieces of slate and walls of stone - it appeared as if they had grown out of the mountain. We recommenced our homeward journey - stopping off at Sarnadela for a drink in the local cafe, before arriving back at the villa. The bike trip was such a good way of seeing the real Portugal - Geoff and Lin were excellent company and I would recommend it to anyone - even inexperienced pillion passengers like myself! Enjoyed the off road on the Suzuki the most - I have always been interested in trail. It was far beyond my expectations and I enjoyed every single day of it. I think we hit the limits of how far we could go on the DR250. The area is extensive and ideal for all kind of off road, trails, stone roads - you name it - I think you can literally drive to the south of Portugal from mountain to mountain without hitting tarmac! Highly recommended for anyone who wants to just tour on the paved roads or one who wants to go off road. 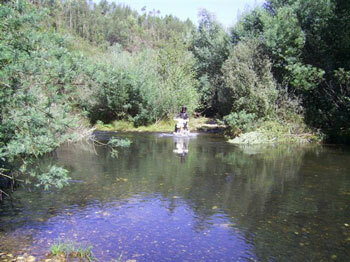 The scenery is magnificent with loads of small places to stop off for a swim and refreshments. Well, after a delay of a year we finally made it and we were so glad to arrive. We spent 2 days travelling and the last day was in the rain but luck was with us and our first morning dawned, bathed in sunshine and what a view from the terrace of this lovely villa. It only got better. Our hosts Geoff and Linda were so welcoming and the food they provided for us was excellent. As vegetarians it is lovely to go to another country and know that you don't have to worry about where and what you will be able to eat. Even knowing where to go was not a problem as Linda and Geoff always had excellent suggestions. For me, our best day was the one Geoff and Linda drove us out into the mountains and took us to a fantastic spot by the river where we had a picnic lunch. Thank you both very much for a wonderful week. Next time, hopefully, we will come down on the bike. Bobi Dog was a bonus as was the mad blackbird alarm clock! !